Mostly eaten tomato salad … YUM! A friend of mine recently got married and before she embarked on a six-week long honeymoon a group of us bossed her into a dinner out. In hindsight, she was probably knackered from the wedding, from sorting out work before heading away and from sorting out the honeymoon … but she graciously squeezed us into what was probably a very packed schedule. Sorry Tash! We decided on Sunny’s as our dinner venue because none of us had been there. Sunny’s is the new (well, opened in late-2016) kid on the block – in the west end but away from Peel and Leigh Streets, yet still sporting the ubiquitous Studio Gram design. It’s cool. It’s hip. 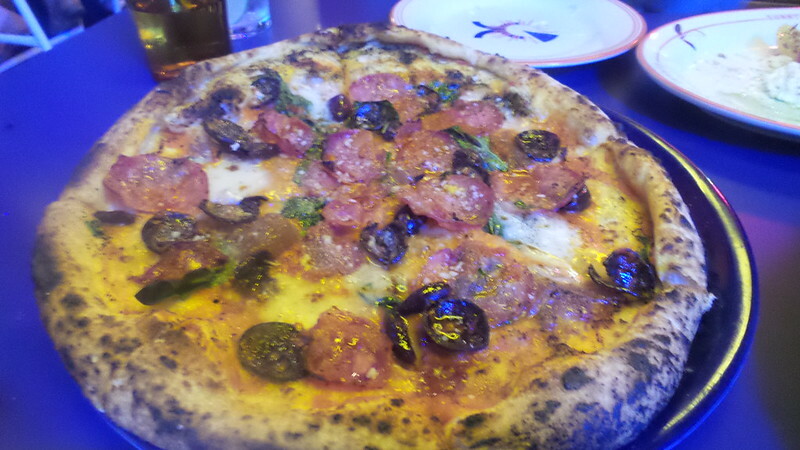 Pepperoni, olives … on a pizza. Check that crust! The menu at Sunny’s is short – divided into pizza and not-pizza. It’s a simple menu and I’d recommend not taking your fussiest friends there. Fortunately, none of us is fussy, so after a bit of to-ing and fro-ing, we decided on three pizzas and two not-pizzas between the four of us. One pizza had a gluten-free base. 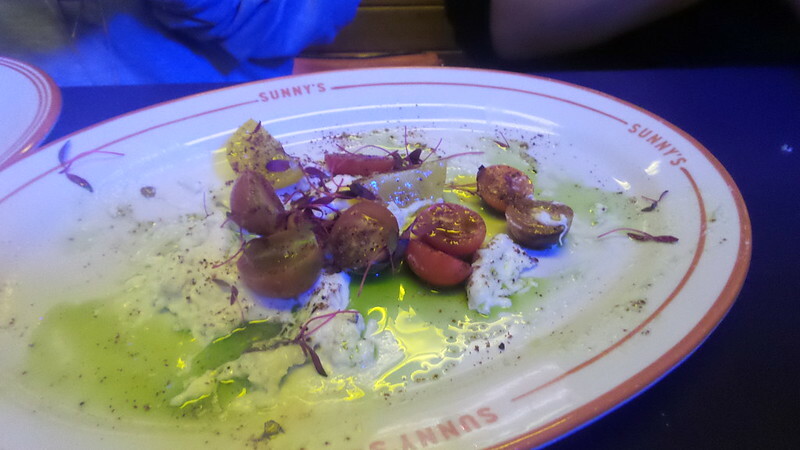 Our not-pizza options were a stunning heirloom tomato salad which I would have been happy to eat over and over again. All I needed was a plate of that to myself and some good crusty, chewy bread and I would have been happy. Dressed with basil oil and scamorza (a soft, cow’s milk cheese which featured very heavily on the menu) and microherbs – it was GREAT! We also had the green salad which was basically a big pile of mixed lettuces dressed lightly with olive oil. On to the pizzas … Well, bad blogger that I am, I didn’t take a photo of the menu so I can’t quite remember what we had. For our gluten-free pizza we had a cheese and mushroom pizza, while pork and fennel and pepperoni and olives appeared on the others. I’m not an aficionado gluten-free bases but, to my gluten-oriented palate – it was horrible. Flat, dense, without the right taste or texture. The topping was dominated by cheese and this was the only pizza that didn’t get demolished. The other two pizzas were pretty good. I preferred the porky-fennelly number (I love fennel so that was always going to happen) but enjoyed the pepperoni one too. 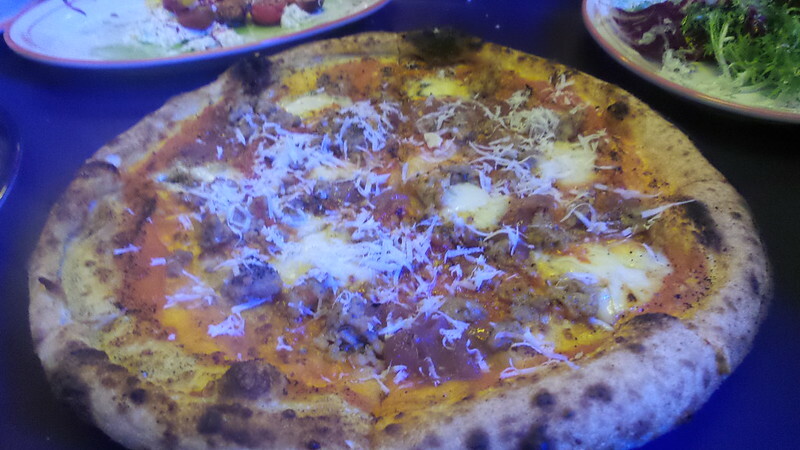 I particularly liked the fat, chewy, charred and blistered crusts. The dough was good. It gets a big tick. One thing that gets a big cross, however, is the service. It vacillated between friendly, helpful, jovial … to, um, not great at all. When we asked about dessert we were told that they don’t do desserts because they don’t have a freezer. Eh?! The upshot? I hope that Sunny’s isn’t too cool for school. Relaxed, casual, laid-back – all awesome things for a venue to pursue. So relaxed your customers aren’t getting their wine (or their bill)? Not so great. Personally, the fact I can’t book and the uneven service means that I wouldn’t put Sunny’s out there as a recommendation and I wouldn’t go out of my way to return. However, the pizzas were good enough that, if someone else suggested it (or I were nearby and there happened to be space) I’d be happy enough to go for take-two.